Russia is offering full-ride scholarships for MA programs in Mathematics, Computer Science, Economics, and Physics. Social media gives individuals global voices. Formerly fringe groups now form large, cohesive communities. Thoughts can be expressed instantaneously, but with no take backs and often little context. Social media is changing politics across the globe. A new Rasmussen Reports national telephone and online survey finds that 52% of Likely U.S. Voters agree that having Russia as a friend is an “asset to our country, not a liability.” Just 27% disagree, but another 21% are undecided. Shkilarov designed campaign-organizing software while running campaigns such those that resulted in 200 surprise victories for liberal candidates in Moscow’s municipal elections. But a national campaign is a whole new level of difficulty. The Presidents agreed to maintain open military channels of communication between military professionals to help ensure the safety of both US and Russian forces and de-confliction of partnered forces engaged in the fight against ISIS. They confirmed these efforts will be continued until the final defeat of ISIS is achieved. Is This Professor ‘Putin’s American Apologist’? Something makes the current standoff between Russia and the U.S. worse than the Cold War: the lack of a common language between the two world powers’ elites. Let’s accept that some of the ‘Russia-linked accounts’ are indeed Russian, though we can’t tell that any of them are actually linked to the Russian government, and let’s accept that Russians are posting things about US politics. Does that amount to ‘interference’? And does it show that Russians are particularly noteworthy interferers, so noteworthy as to justify a vast witch-hunt? Russian lawmakers last week named U.S. outlets CNN, Voice of America, Radio Liberty and its “Current Time” television channels as likely targets of Moscow’s retaliation, saying the State Duma could pass the new restrictions on the news organizations as early as this week. RT reveals all in their dealings with Twitter during the 2016 campaign season. Google is planning to “de-rank” Russian news sources. According to Kaspersky, the creators of the malware may be fans of Game of Thrones as some of the computer code contains the names of characters from the fantasy drama. The call follows a move by Google to de-rank posts from Kremlin-funded news outlets RT and Sputnik, which are accused of propaganda. U.S. lawmakers have released a batch of Facebook ads linked to what many of them say are Russia’s efforts to disrupt the 2016 U.S. presidential election and stir up emotions on sensitive social issues. Democrats and the media have been on a yearlong deep dig into Russian involvement into U.S. elections. But when you dig a hole you sometimes run across things you wish had remained buried — like the dirt pointing to Russian ties to the U.S. environmental movement. As global oil prices stay low, as federal budgets tighten, and as prospective trade along the Northern Sea Route remains risky, why is Russia continuing to build up its military presence in the Arctic? The Pentagon’s Defense Intelligence Agency has released a new assessment of Russian military power—reviving a Cold War-era practice. The agency concludes that the modern Russian military builds upon its Soviet heritage but has modernized its capabilities and doctrine for the present day. And how at least one liberal Russian newspaper did report on it. Russia seems primed to stay ahead of its competitors in some capabilities (anti-ship missiles, electronic warfare, air defenses), narrow the gap in areas such as drones and precision-guided munitions, and continue to lag well behind in a few areas such as surface ships and automated control systems. Michael Kofman on Sean’s Russia Podcast. Kofman is Research Scientist at CNA Corporation and Fellow at the Kennan Institute where he specializes in security and defense in Eurasia. He comments widely on Russian military affairs and foreign policy. He also blogs on the Russian military at his site Russian Military Analysis. Where does encouraging foreign language proficiency end and “Russification” begin? 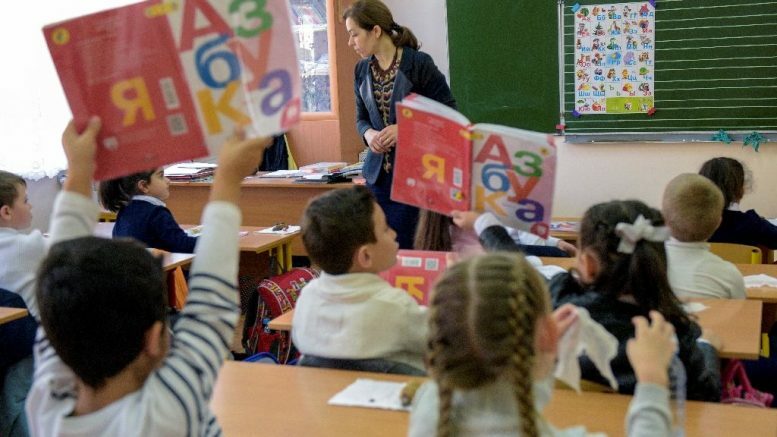 The ruling coalition earlier backed reform, according to which national minorities’ schools will have to switch to teaching nearly all subjects in Latvian within the next three years. Now, Sergey Zheleznyak of Russia’s State Duma (lower house) claims the decision is a violation of the European Union’s legal framework and resembles linguistic genocide. Persian, as spoken across Central Asia, is actually a bewildering assortment of dialects. Language has long been a sore point in Afghanistan, where it has exposed unresolved tensions among the country’s ethnic and linguistic groups. Ukrainian officials signed the deal with the self-proclaimed republics of Donetsk and Luhansk on Thursday, the Lenta news site reported. The eastern Ukrainian region of Luhansk has a new separatist leader following an armed standoff between local warlords, amid a flurry of fatal clashes between Russian-controlled militia and government troops. Teens of Transnistria: How Does It Feel To Grow Up in a Country Shunned By the Rest of the World? Without recognized borders or even existence, the local economy is handicapped – but traveling to the outside world is much more difficult. So what is it like to grow up in a place that doesn’t officially exist? The next trilateral meeting between Iran, Russia and Azerbaijan will be held in Moscow in 2018. This new 525-mile rail line will take you from Istanbul to Baku via Tbilisi. The rail line itself has just been opened and passenger service is expected to start next year. The food scene is also burgeoning – hipster burger joints, elegant traditional restaurants and Turkish cafes compete for business near the waterfront. Chilled Abkhazian wine and locally brewed Sukhumskoe beer are both popular during the warm summer months. An entity as much cultural as it is geographic, traditional boundary concepts are nearly meaningless when trying to define Central Asia. At the center of vast and vastly diverse Eurasia, Central Asia is at once unique from and inseparably tied to the lands that surround it. Many predicted a “violent re-bordering” of Central Asia with the collapse of the Soviet state along with flare-ups in ethnic tensions. Instead, the various states turned domestic borders into international borders surprisingly quietly and in ways that reflected their diverse methods of state-building. This brief policy memo details how that was done and gives some very practical, non-idealistic (and thus probably controversial) ways to further develop border relations in the area. This includes understanding where and why open borders work as much as understanding where and why they don’t. Opposition leader Babanov, who won 33% of the vote in the recent Kyrgyz presidential elections, has fled the country and is reportedly stepping down as leader of this party. He is being investigated by the state for serious criminal charges. Russia is threatening to cut museum and artifact exchange ties the Netherlands if an Amsterdam museum upholds a decision to give Ukraine ancient gold artifacts left in bureaucratic limbo when Russia annexed Crimea. While religiosity in Poland, Europe’s most religious state, is beginning to lose ground, religious slogans are gaining ground among Polish far-right movements. The parties may sign an agreement to create the mining fund by the end of the year, he said. The fund will begin with about $500 million before expanding and may make its first investment in 2018. Far East Development and China Gold will each invest $100 million, with a further $300 million from private investors. Japan, lacking fuel resources, is the world’s largest importer of the gas while Russia wants to boost its global LNG market share, currently less than 5 percent.